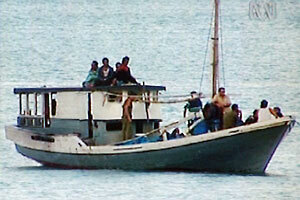 Fourteen asylum seekers, Kurds fleeing from Turkey, sought refuge in Australia in November 2003. This is their boat, the Minasa Bone, before it made landfall at Melville Island north of Darwin. The Howard government towed them all the way back to Indonesia. UNHCR regional representative Michel Gaubadan called it "a new low" for Australian refugee treatment. It was discussed in the media all over the world. Fourteen asylum seekers, Kurds fleeing from Turkey, sought refuge in Australia. In an extraordinary move the Howard government retrospectively excised thousands of islands, including Melville Island, only for this regulation to be disallowed two weeks later - but too late for the Kurds. Below is Australian Democrats' leader Andrew Bartlett's Motion of Disallowance - which was won - and his speech, including some questions relating to returning TVP holders to Afghanistan. Senator BARTLETT ([24 November 2003] 2.59 p.m.) -My question is to the Minister for Immigration and Multicultural and Indigenous Affairs. It relates to the finding of Justice Mildren in the Northern Territory Supreme Court regarding action to do with the detaining of asylum seekers off Melville Island and the finding of the judge, amongst other things, that it is plain that the policy of the government is to operate 'as clandestinely as possible', the finding of the judge that even the information provided to the court by the minister's representative was found to be 'quite minimal', the court's finding that 'behaviour of this kind usually implies that there is something to hide' and the judge's comments that he was 'far from satisfied' that detention was unlawful. Senator BARTLETT -I ask the minister: is this an indication that the government have something to hide? Why is it that they have something to hide? The PRESIDENT -That was a very long question but there was a lot of noise on my right as well that did not help. Senator VANSTONE -Mr President, the plain facts are that I did not hear what the question was. I did hear a lot of preamble, at which point the time for the senator's question expired and his question, if he did in fact put it, was drowned out by my colleagues alerting you to the fact that his time had expired. If you wish to allow him the question, he will have to put it again, but he can only have a minute to do it. The PRESIDENT -Senator Bartlett, could you ask your question briefly. Senator BARTLETT -I will ask the question within a minute-as I did the first time, I might say. My question relates to the finding of the justice of the Supreme Court last week who, among other things, said that it was plain that the policy of the government was to operate as clandestinely as possible and that even the information provided to the court by the minister's representative was found to be quite minimal, the finding that behaviour of this kind by the government usually implies there is something to hide, and the justice's comment that he was far from satisfied that the detention was unlawful. In my 30 seconds remaining, the final part of my question to the minister is: what has this government got to hide? Why is the government so keen to keep information from the public, legal advisers and even the courts about its actions relating to asylum seekers and refugees? Senator VANSTONE -I thank the senator for his question. I have not read the full judgment of the Northern Territory court but I am aware of the remarks, generally speaking, that Senator Bartlett refers to. Putting aside the judge's reference to what certain behaviour usually means and whether the judge is therefore backing away from saying he concludes it means that in this instance or is simply seeking to get the benefit of making that inference without actually being prepared to say that, yes, Mr President, I can assure you that the government takes people-smuggling very seriously. When we believe there is a people-smuggling boat in the vicinity, relevant agencies go into operational mode and they are very careful about what they say, I think for quite obvious reasons, because there are people in the community who will take any opportunity they can improperly to frustrate the government in its objective of lawfully carrying out its policy. The government is required to act lawfully and if on any occasion it does not it faces the consequence of that. I have no reason whatsoever to believe that the officer who made remarks, if it was in fact an officer, or the barrister who was acting for the Commonwealth, said other than what they knew at the time. Senator BARTLETT -Mr President, I have a supplementary question. Given the minister's comment or statement that there are people in the community whom they need to keep in mind when considering the way they act, does this mean that Australia's courts, including the Northern Territory Supreme Court, are amongst those that they need to keep information from? Has the minister received categorical legal advice that indicates that all of the government's actions in relation to the recent activity off Melville Island were lawful in every way? Does the minister also have legal advice indicating that the government's overall policy of ongoing detention is lawful in every way? Senator VANSTONE -Senator, the answer to your first question-does this mean that the Northern Territory courts or other courts are in the category of people from whom information should be kept? -is no, it does not mean that at all. As I indicated to you in my answer, I have no reason to believe that the advice offered to the court was not the best advice available at the time. Senator Hill -Mr President, I ask that further questions be placed on the Notice Paper. That the Migration Amendment Regulations 2003 (No. 8), as contained in Statutory Rules 2003 No. 283 and made under the Migration Act 1958, be disallowed. This regulation has just been tabled but was, of course, as senators would be aware, originally gazetted a couple of weeks ago-a few hours after the arrival of a boat containing 14 apparently Kurdish people from Turkey. The regulations have received widespread public coverage, and this is the first opportunity the Senate has had to disallow them. It is fairly clear from the public responses of the Democrats, the ALP and the Greens that there was wide opposition to these regulations. I could, and have a desire to, speak at length about the matter, because it is a very serious matter and an area of great concern to me. I do note that we have only two weeks of sitting left and a lot of legislation to go through and that it is a matter that, to some extent, has been debated before. For that reason, and for that reason only, I will try to keep my remarks shorter than they might otherwise have been. I should point out that the government had the opportunity to have this debate when we had the special urgent sitting last Friday week. If it had been agreed to at that time then these current two weeks would not be taken up with this debate. I certainly feel it is very much the government's fault that time in these final two sitting weeks, when time is at a priority, is being used up on this debate when it did not need to be. However, all of us, not just the government, have to deal with getting through the business without sitting ridiculously late hours so, for the benefit of non-government senators rather than government ones, I will try to keep my remarks short. These regulations do not just excise Melville Island and Bathurst Island from the migration zone, as I certainly thought from initial reports and as others may still believe. These regulations excise many thousands of islands off the coast of Australia, as far down as the Whitsundays, in my home state of Queensland, all the way across the top of Queensland, the Northern Territory and Western Australia, and quite a fair way down the other side of Western Australia. They were obviously introduced specifically to deal with the situation on Melville Island. There has been an enormous amount of debate and, indeed, coverage of the government's actions in relation to that, including the blatant misleading of the Australian people about the actions of some of the Kurdish people who arrived on the boat. I would like to say a couple of things about this specific situation before talking more broadly about the excision of islands. Firstly, we had a pretty clear inference from the Minister for Foreign Affairs, Mr Downer, that there could not really be a problem; that the people were from Turkey, Turkey is pretty okay these days and so they could not be refugees-and I will find the direct quote for my concluding remarks if senators wish me to do so. But quite clearly-and I am quite sure the Minister for Foreign Affairs knows this-Kurds in Turkey are still having a pretty hard time of it, as they are in Iran, and as they still worry they will be subjected to again in Iraq in the future. Currently in Australia we have a small number of people, but nonetheless a number of people, from Turkey who are on temporary protection visas, according to figures provided by officials from the Department of Immigration and Multicultural and Indigenous Affairs at Senate estimates just a couple of weeks ago. I think they numbered in the thirties, but I might be wrong there-maybe it was in the low twenties. I do not know whether or not those people are Kurds, I do not know how they arrived here and I do not know when they arrived, but it must have been within the last three to four years if they are on temporary protection visas, because that was when those visas were introduced. Clearly, conditions in Turkey have been dangerous enough in recent times for at least some people from Turkey to be given asylum in Australia. For us then, to not just turn Kurds from Turkey around-and we all know they are subject to persecution there-but also turn our gaze away from people who clearly could credibly have been seen to be in need of protection from persecution is an extremely dangerous act, compounded by the fact that obviously Indonesia was not aware that that was what we were going to do. Initial indications were that the Indonesians were sufficiently annoyed by this that they were going to take these people and shunt them all the way back or off to somewhere else-and it did not really matter where, just that it was out of Indonesia. My understanding is that that is why the UNHCR spoke out so publicly in opposition to the government's actions, which they do not normally do. They certainly express a view, but they are usually fairly diplomatic. They were much less diplomatic than usual, such that the government sent in a representative of their own to express concern to the UNHCR in Geneva, as I understand it. The reasons why the UNHCR were much less diplomatic than usual were that they were genuinely scared and concerned that this group of people, having been forced back to Indonesia, might then be forced onwards again by Indonesia because Indonesia was so annoyed at what had happened. That would have been direct, blatant refoulement of people who, as I have said, quite credibly could have been seen to have had a genuine claim of a need for protection. That is a strong and very problematic aspect of the government's actions in this regard. While I am on that specific instance, I should say that, from my point of view and from the Democrats' point of view, it is preferable for people to be assessed by the UNHCR in Indonesia than for them to get on very dangerous boats to come to Australia and be assessed here-as long as the process in Indonesia provides a reasonable prospect of resettlement if they are found to be genuine refugees. Some of that work is being done, and I support that aspect of the government's policy, which they have worked on in recent years. It is better all round, as long as the people are safe in Indonesia and as long as there is some prospect that they can be resettled in a reasonable time if they are found to be genuine refugees. We should continue to encourage that process, as long as Australia keeps taking its fair share of those refugees. I think the Minister for Immigration and Multicultural and Indigenous Affairs referred to that herself in one of her answers in question time today. That is very different from, if they do get here, putting them at risk, turning them around and, as I understand from statements is what happened, leaving them in Indonesian waters to sail off to some port-particularly when as far as we can tell, as close as we can get to the truth of the matter, the Indonesians were not consulted. They certainly were not consulted in terms of: 'What do you think we should do? Let's work something out together.' They were just told. We were told that these people were not asylum seekers when quite clearly they were. I find it impossible to believe that anyone could think that they would not have attempted to ask for asylum. I remember the current Minister for Immigration and Multicultural and Indigenous Affairs-with a previous hat on-when there was a lot of push from Labor to talk about a coastguard a few years back ridiculing that proposal a number of times. It is not one I support either-in the context of this debate, anyway. The reason why she used to ridicule it was that people who come here on boats come here, as she would say herself, to be found. They ask to be found; they seek to be found so that they can ask for asylum. She knows that herself; she has said it many times. So the suggestion that somehow this group of people might have sailed over here and forgotten to ask for asylum-or did not think of it or were never going to ask-is ludicrous. That extent of willingness to weave a fabric of deception around so many aspects of this policy area is, I believe, one of the reasons why it is so problematic. That is a commentary on, or criticism of, the broader government policy. I have spoken on it many times before and I will speak on it many times again, but I will not go into it further now. Moving on to the specifics of this regulation, I have spoken about the incident to which the government has sought to apply it. That incident has already happened. The people are now out of Australia again. There has been some legal opinion that the regulation may not be legally valid in relation to the Melville Island situation because, as far as we can tell, it was brought in a couple of hours after the people landed on the island. I do not know whether that is the case or not; it is a matter of legal opinion and interpretations of the act. At the end of the day the final interpretation of an act is not going to be decided by argument between senators; it is going to be a decision of a court, and until a court makes that determination it is a moot point. Given that the people are already out of the country it is even more of a moot point, other than to consider whether or not it is an issue to be addressed for future eventualities. Another aspect of this is the broader issue of the regulations. The Melville Island incident has happened. There are still a lot of questions that need to be asked about it. I know that many in this chamber, including opposition senators-and Senator Faulkner has spoken about it-want to ask questions because it is an important issue of public policy and of transparency. But the incident has happened. We will investigate it; we will look at it as an incident. As they stand, the regulations leave in place the excision from the migration zone of thousands of islands around Australia. I believe on principle, and the Democrats strongly believe, that if you have a legal regime that provides certain restrictions, entitlements, rights and rules it should apply across the country and not only in certain parts of the country-depending on where you happen to be standing-unless there is a very good reason why it should be specific to a certain geographic location. If you are talking about something as basic as what people's rights should be under a migration act-whether they are entitled to protection from persecution-then the idea that you can get protection from persecution in one part of Australia but not in another is extremely offensive. There is no logical reason why it should apply to islands and not to other parts of Australia, and I would suggest that there is no logical reason why the government could not simply seek to excise all of Australia for the purposes of application for protection visas. Maybe that is what they would like to do down the track: prevent people from even being able to lodge a protection visa claim onshore if they arrive without a visa. There is no rhyme or reason in terms of legal principles why you can do that if you get to one part of the country and not if you get to another. So on principle I think it is very dangerous. As one component of the Pacific solution it is something the Democrats have opposed across the board, so obviously we oppose this extension of it. We opposed the initial excision of Christmas Island, the Cocos (Keeling) Islands and Ashmore Reef when it occurred in 2001 and we opposed the insertion into the act of the power Minister Vanstone has now used to further excise other parts of Australia by regulation. Obviously we were not in a majority on that occasion, which is why we are having this debate today. Since that time the government, via the previous minister and the current minister, have attempted repeatedly to excise large numbers of islands-they might be slightly different islands in each case-first via regulation, which was disallowed; then by legislation, which was defeated; then by a second attempt at legislation, which was defeated. That of course now constitutes a potential trigger for a double dissolution, should the Prime Minister wish to use it. Technically, under the law, the minister can gazette every six months regulations that do the same thing, if she chooses, and the Senate can keep disallowing them. While it may be technically legal, I would suggest that to do so is not within the spirit of that power when you have before the parliament legislation that does effectively the same thing that has been rejected twice. That gives a pretty clear sign that the Senate does not agree with it. Unless there is some reason to think that the situation has changed, it is flying in the face of the will of the Senate to continue to introduce regulations that produce the same effect. That is a reason why I think it is inappropriate for the government to continue to seek to introduce these sorts of regulations. Nonetheless, they have that power and obviously they can use it. If it continues to happen the Democrats will continue to disallow such regulations. There is always the problem that in the period between a regulation being gazetted and the Senate having an opportunity to move to disallow it these sorts of unjust and inequitable provisions can have legal force. That is a problem that can only be overcome by removing the relevant provision from the Migration Act. That is something the Democrats would certainly like to achieve. We are always supportive of any moves to do that when we believe there is a majority in the Senate to do so. I certainly urge other parties-in particular the ALP-to give that matter some further consideration and remove that relevant provision from the act. Otherwise we could quite possibly be in this situation any number of times in the future whereby another group of people are treated the way this group have just been treated and all of the various questions and doubts about the legality as well as the morality of the situation will arise again. It is best if we remove the power once and for all, but in the immediate circumstance all we can do is disallow this particular attempt and seek to use other mechanisms to get answers to some of the questions that still need answers in relation to the specific Melville Island incident. Senator BARTLETT (Queensland-Leader of the Australian Democrats) (6.11 p.m.) -In conclusion, and as a perfect segue from Senator Crossin's comments, there is a party out there that could sort this out. Of course, I would suggest that party is the Democrats. Nonetheless, in relation to this particular measure, it is pleasing to have a commonality of views from the ALP, the Democrats, the Greens, and, I am sure, some of the Independent senators. As I said at the start, I will not use up all of my time. That does not mean that it is not an issue that I have very strong views about, but I will try not to add to the time pressures in this final fortnight. There are a couple of points that I think do need emphasising. The Minister for Immigration and Multicultural and Indigenous Affairs spoke about the cost and how, if we disallowed this, it would mean that the Australian taxpayer would have to pay the cost of bringing people to the mainland and 'looking after people'-as she put it-while we determined their claim. I think it is more commonly known as putting people in detention than looking after them. That insistence by the government on detaining people is very costly. The insistence by the government on having excised offshore places such as Nauru and paying for them through the taxpayer is very costly. The cost of shifting all of the Vietnamese boat arrivals that came a few months ago from right next door to a detention centre in Port Hedland to Christmas Island, where they still reside, was very costly and utterly unnecessary. Senator Crossin spoke about the cost of the Darwin detention centre that has never been used. A huge, or fairly sizeable, detention centre is planned to be built on Christmas Island that will be incredibly expensive-far more so than if it was built on the mainland. Accommodation has already been built for the detention centre that does not exist yet on Christmas Island that has to be maintained. It is very expensive. All of that cost is unnecessary. So to suggest that somehow the Senate's disallowance-the removal of the excision-is a problem in terms of cost, I would suggest, is a farce. It is the government that are expending millions and millions of unnecessary dollars purely because of their wrongheaded approach to dealing with asylum seekers and people who arrive without visas. We need to be accurate in our language. It does not mean we have to necessarily accuse people of deliberately misleading, although there clearly has been some of that in this debate over time. The Democrats believe excising islands does not protect our borders. To use the phrase 'border protection' is simply a misnomer. Treating somebody differently when they get here does not make us less or more safe, or our borders less or more protected. As we have seen with this case, the issue is how they are treated when they arrive rather than whether or not they are some sort of threat that we need protection against. It is pretty clear, I think, to Australians now that any alleged or possible threats to our security from people who arrive here from overseas come from people like the Frenchman who received some publicity in recent times, Willie Brigitte. He was in this country for over six months and allegedly was a trained terrorist looking to do some very nasty things. That is where the threat to our security is and that is where I would suggest the money needs to be spent, rather than on all of the surveillance that is continuing to be spent in our northern areas. I would also apply that to the expense of a coastguard, at least as far as it relates to people who are arriving here seeking protection. The real people we need protection from are those who are potential terrorists, and that is where the resources should go. The minister said, 'Anyone that looks at a map can see why we would excise islands and not the mainland.' My understanding is that these regulations excise islands all the way around the east part of the Queensland coast down as far as the Whitsundays, but they do not excise Darwin. It is a lot easier for this group of people we are talking about to get to Darwin than to the Whitsundays. I hasten to add that I am not suggesting we should excise Darwin, but I think the suggestion that islands have some special character just because they are closer is not borne out by geography either. It is simply a matter of extending the principle, and the principle is one that the Democrats do not support. In responding to some of these issues I am trying to keep the debate as much based on facts as possible without getting too much into emotional rhetoric. To try and increase the community's understanding about the facts behind this issue it is sometimes harmful to get too worked up-although I must say I find it difficult not to get worked up about it when I see what the human consequences are. The minister spoke about this making it harder for people smugglers to ply their trade. I do not know whether or not excising these islands that are contained in the regulation makes it harder for them. It is acceptable to suggest that one could at least try to argue the case that it does make it harder for people smugglers-maybe it does. I will tell you who it makes it even harder for: refugees and asylum seekers. If we have a policy that makes life harder for people who are innocent, who are guilty of nothing other than fleeing persecution, then I do not believe it is a policy that should be supported. I think we need to find another way. A policy that makes life harder for people who have already suffered so much is one that should not be supported, even if it does make things a bit harder for people smugglers as well. The minister also said the purpose of this is to put people in a position where they cannot make a claim. Senator Vanstone -No, I didn't. Senator BARTLETT -I thought the minister said that the purpose of excising things was to put people who arrive on those islands in a position where they cannot make a claim. Senator Vanstone -On the islands, yes. They cannot be considered unless they are onshore-that is right. They can make a claim. Senator BARTLETT -That is the basic fact: people that arrive on an excised island cannot make a claim for protection. Senator BARTLETT -In Australia. What we are doing is sending them back for somebody else to deal with. I do not believe that is an appropriate response. As I said in my earlier remarks, if we have an opportunity to get people assessed in other areas, that is good-it saves them risking their lives getting on boats. But if they have done that and they have got here then we should not add to it by turning them around again, particularly where we do not have a guarantee that they will not to be further moved on. That is particularly my concern in relation to this Melville Island incident, and I would suggest that it was the concern of the UNHCR. The other aspect that I want to emphasise again and clarify from what I said before is that assessment in Indonesia by UNHCR is fine as long as people have a reasonable chance of resettlement. They do not actually get resettlement in Australia if they get a temporary protection visa. That is, in the cases of many of them, all that we offer them. They are denied resettlement assistance because, according to the logic of a temporary visa, they are not settling but are just here temporarily. So they actually do not get a chance to resettle. The minister said in her comments, 'This isn't a cruel and harsh policy.' I am sorry, but it is. There were many people here today in this parliament who are temporary protection visa holders. They wanted to send a message of thanks to the people of Australia, for having had the opportunity to be safe here, for being welcomed by people and for being supported by people in the community. But the fact is-and this is the fact that they wanted to emphasise-they are not secure and their future is not safe. They live in fear of being sent back to a place which our own system has recognised as a place where there is a genuine fear of persecution. They have had their futures stolen from them. They would like to have a clear future-one other than living in perpetual fear of being sent back to somewhere that our own system has recognised is a place they have very good reason to be fearful of. You simply cannot deny the suffering that those people are going through. There are thousands of them in Australia-I think over 6,000. Some of them were here today, firstly, simply to say thank you and, secondly, to try and give people-parliamentarians, the media and others-the opportunity to look at it in terms of the human cost to these people. It is fine to talk about overall policy, intent, what it is going to do, what it means for people smugglers and all of that, but what it also means for individual human beings-for the children and some of the young girls that were there today singing our national anthem-is that they are going through hell. They are going through hell because of our policy-our country's policy, I hasten to add, not the Democrats' policy. We simply cannot pretend that it is not a cruel and harsh policy. It may not be the government's desired intent, but it is a consequence. As I said before, any policy that, as one of its outcomes, generates enormous extra suffering for people whom we recognise to be refugees is a policy that must be changed, whatever else it achieves. That is broader than just the excision we are talking about today; that goes to temporary protection visas. Temporary protection visas through designated offshore places are a key part of this government's strategy. Excising islands is another part of that, and temporary protection visas are a key component of that. Even with them getting assessed in Indonesia it does not guarantee them a reasonable chance of resettlement inasmuch as those who do get to come here are still liable to be in a position where they are temporary. Those facts of the situation do need to be recognised as part of this debate. I would hope that as we genuinely seek to wrestle-and the government and the minister no doubt will be forced to wrestle-with the dilemma of the thousands of temporary protection visa recipients in Australia who are genuinely fearful of returning and are simply looking for a clear future, one where they can actually contribute fully to the Australian community, we will have to look at a policy shift somewhere along the way. Excising islands is, in some ways, a small component of that. It is almost peripheral to the trauma of those thousands who are already in Australia, but it is part of the policy that has led to this situation and it is part of the policy that the Democrats certainly believe needs to be changed. For that reason, I am pleased that the anticipated successful outcome of this disallowance motion will occur. I urge all senators to continue to work for a more humane outcome, whilst recognising the difficulties that do exist with having to deal effectively with the enormous numbers of people who, unfortunately, find themselves fleeing persecution around the world. Senator BARTLETT ([25 November 2003] 2.22 p.m.) -My question is to the Minister for Immigration and Multicultural and Indigenous Affairs. Is the minister aware that the United Nations High Commissioner for Refugees recently suspended voluntary repatriation of Afghan refugees from Pakistan because of the deteriorating security situation in Afghanistan and the killing of a UNHCR officer? Is the minister also aware that the UNHCR has closed offices in the cities of Kandahar, Gardez and Jalalabad and that it currently cannot assist returning Afghan refugees? Is it the case that it is planned for a number of Afghanis to be removed from Nauru back to Afghanistan next week? Will the government now acknowledge that Afghanistan is not safe and is not likely to be safe any time soon, and stop pressuring people on Nauru and those who hold temporary protection visas in Australia to go back to such danger? Senator VANSTONE -I thank Senator Bartlett for his question. In relation to the specific allegations he makes about the UNHCR in Afghanistan, my answer is, no, I am not aware of those nor do I have details of the four or five people, or any such number as he might have mentioned, who may be due in the near future to be returned to Afghanistan. I will-straight after question time, if someone has not done it already-get together a brief on both the situation you refer to in relation to the UNHCR and the people who may be about to be repatriated, and I will come back to you as quickly as I can with respect to that. As to whether the incidents to which you refer as having happened in Afghanistan mean that across the board Afghanistan is not a safe place for anyone to return to, that is an entirely different question. Senator BARTLETT -Mr President, I ask a supplementary question. In addition to seeking information about the safety or otherwise of many parts of Afghanistan, and the fact that the UNHCR has pulled out of large parts of Afghanistan and is unable to provide assistance, can the minister give a response to calls from communities, such as Young in New South Wales and Albany in Western Australia, who are calling for assistance in enabling Afghan people on temporary protection visas who are working and providing productive assistance to those towns' economies to be able to stay working in Australia and make a long-term contribution to the community, rather than be pressured to be sent back to a country that quite clearly is not safe for them or, even more importantly, for their children? Senator VANSTONE -Senator, you have given me the opportunity in your supplementary question to clarify what I am sure you understand but, in case there is anyone else who does not, I will make it clear. Australia does not repatriate people if we believe there is a risk to them-an inappropriate risk: I mean, there is a risk in walking across the street obviously. Each case is treated individually and on its merits. If people are judged to need further protection, they are given it. That is the situation with people on temporary protection visas. At the expiration of that visa, they can make an application for further protection and, if further protection is required, it will be given.